Growing heirloom tomatoes can be more challenging than growing hybrid tomatoes–expecially where tomato diseases are prevalent–but the flavor of heirlooms is often superior, and worth the extra effort. Heirloom tomatoes are open pollinated (non-hybrid) tomatoes that reproduce true to form from saved seeds. Many have been passed down through families or spread neighbor-to-neighbor–some through generations– because of superior flavor, high yield, or reliability. Heirloom tomatoes are often thin-skinned, easily bruised, or otherwise unsuitable for shipping and distribution, but can be found in farmers markets or grown in backyard gardens. Tomato diseases are probably the biggest issue when growing heirlooms. Some have greater disease resistance than others, but few have been bred specifically for resistance to common tomato diseases the way tomato hybrids have. 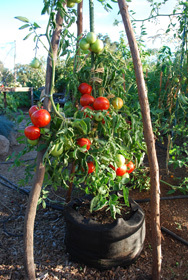 For a list of heirloom tomato varieties I’ve grown and recommend, click Here. Choose varieties appropriate to your climate. If you have a 70-day growing season, don’t expect success with a 100-day heirloom beefsteak tomato. You may get some fruit, but the plants will be weaker and more susceptible to diseases. 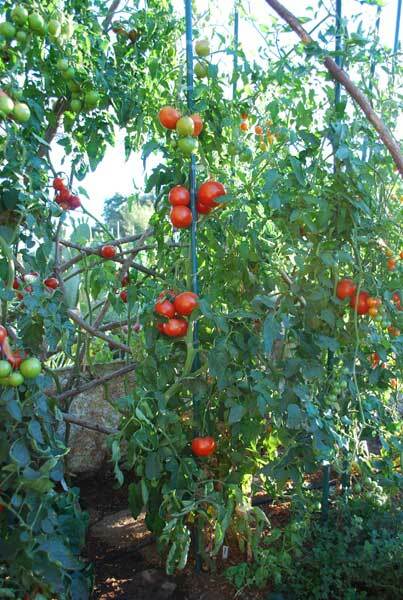 Your local agricultural extension service will usually supply a list of tomatoes that grow well in your area. The list may or may not contain heirloom tomatoes, but it’s worth checking. You should also talk to local gardeners, especially old-timers, and ask them what varieties they grow. Garden clubs are another good resource. It's important to find out which varieties work–and don't work, in your area. Adjust your soil pH, if needed. In alkaline soils, phosphorous, potassium, iron, and zinc are bound up and less available to plants. 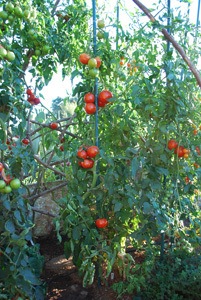 Nutrient deficiencies make tomatoes more susceptible to diseases. See Lowering Soil pH for ways to acidify soil. Tweak your soil. Good garden compost and/or worm castings are the best organic soil amendments. Granite dust and kelp meal add trace minerals that improve plant immunity and adaptability to temperature extremes.